My friend Gwen is moving to Venezuela. I don’t usually mention people by name in my blog, but I feel like writing a little ‘ode to Gwen’. Gwen has been a safe and supportive friend to me for three years and she is really funny, which I think is the most attractive thing a person can be. Gwen had a bunch of us to her place one last time last night under the pretense of drinking all of the rest of her booze, of which she had a classy collection. It was actually an entirely restrained and enjoyable party with lots of homemade food and the right number of people in the room so that you could connect with every one of them. Gwen packed up her house last weekend, so what she had left was all stuff she isn’t taking along with her. As I have done myself when I have been moving, she had a table set out with things to give away. These are usually odds and ends that have some use to someone, but don’t have enough value to warrant putting a price on them to try and sell, as moving expats commonly do. 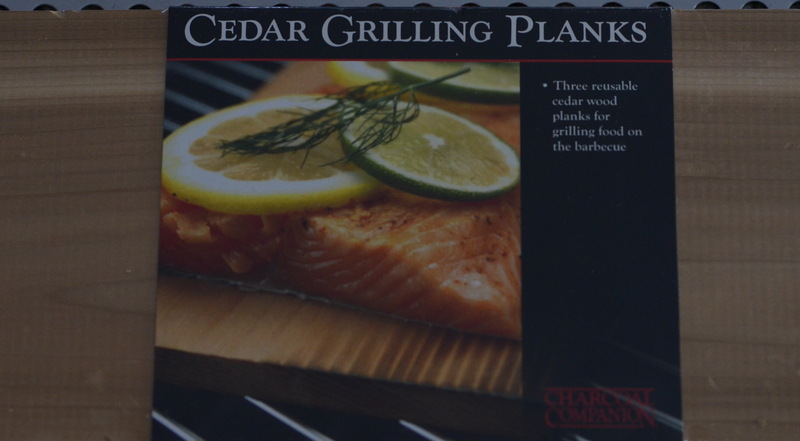 I spotted this unopened package of cedar grilling planks and knew that was for me. 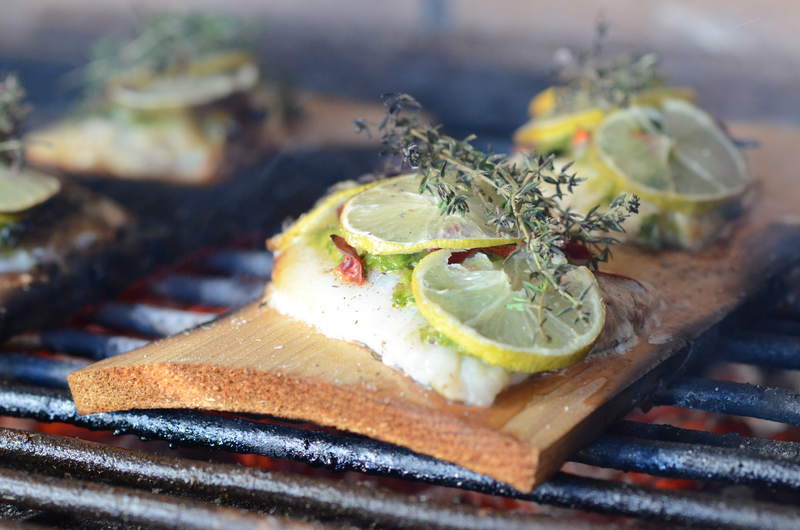 Now, it’s not that I don’t already have cedar grilling planks. I also brought some back to Tunis last summer or even possibly the summer before, and seeing that Gwen hadn’t used her planks either got me thinking about the things that expats horde away and why. I don’t really think I had any intention of cooking on the grilling planks when I bought them. I am certain that I bought them at Costco during one of our final shopping trips to buy stuff to take back with us. At that point, usually during the last week of July, we are saying a premature goodbye to summer in the Northwest. We have finally gotten our farm back to a state of harmonious functioning, and we have had a few weeks of living large on the island: crabbing, and cooking over wood fires, staying up late with the extended daylight hours, and visiting with lots and lots of friends. We are drenched in the scent of smoke and salt and fish, a life brine that numbs us with contentedness. 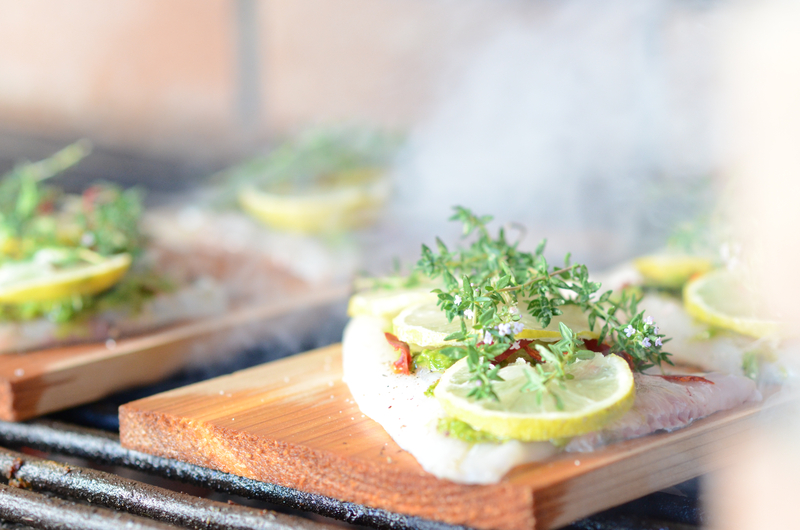 In that mixed state of bliss and resignation that the end was near, I spotted cedar grilling planks, and they held all of those sensory ideas: the wood, the fish, the fire. Also, they didn’t weigh much and they were unbreakable. These were a no-brainer purchase; these would make me happy. I never used them because then I wouldn’t have them anymore. Ironically, I also don’t get them out and smell them very often because they make me unbearably homesick and I try to live in the present when I’m overseas, not spend my days on the Mediterranean pining for the Northwest. I know that beautiful life is still there and that I will, hopefully, have my days there again, just not quite yet. The giveaway. Moving on to another location slaps one in the face to the little shrines you have created for various emotional reasons. You had ideas about how you were going to live your life in this place and maybe that is how you lived and maybe it isn’t. The fantasy you created was for here, not for the next place. You are already creating a new mental plan for that life. 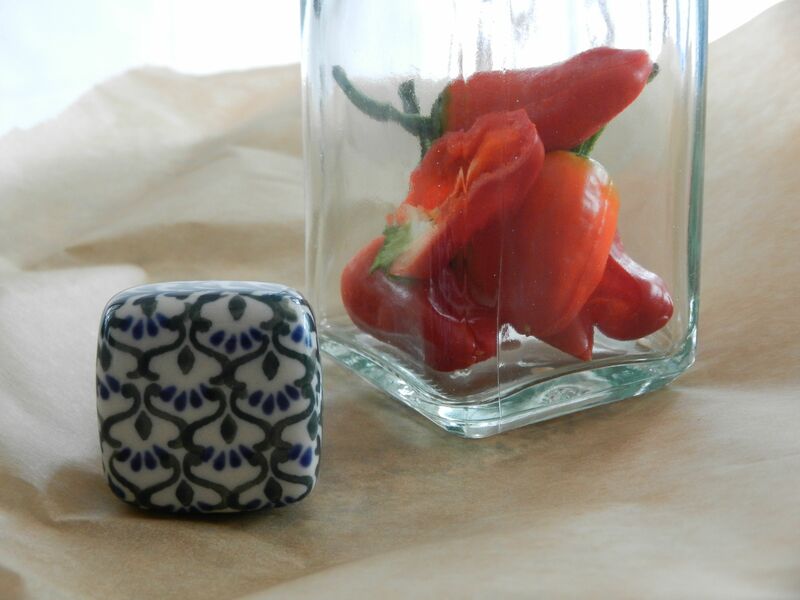 Little items that held some joy, that represented an idea you had say of hosting some little party where you grilled Mediterranean fish on cedar planks and treated your friends to a Northwest experience, have vanished. These little dream-holders become worthless and you can suddenly, easily give them away and are glad to see them go. I am probably way over signifying Gwen’s grilling planks. That was all about me there, not necessarily Gwen, but she gave me a little freebie to use them and still not use my own. I can have my planks and grill on them, too. When I do, I am going to think about Gwen and her hopes for Tunis and her continuing ability to hope nice moments for her life ahead and share them with her new friends. 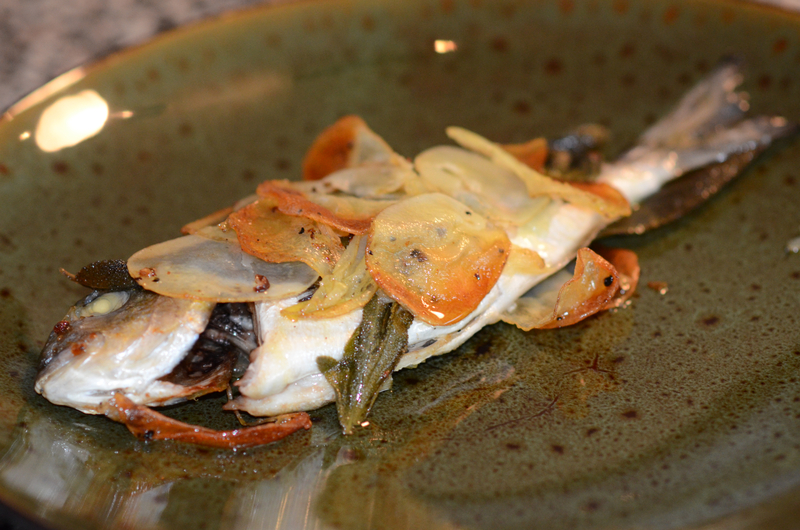 If you are also hording grilling planks in your kitchen, you could break them out and cook this fish dish, pretty much the world around. 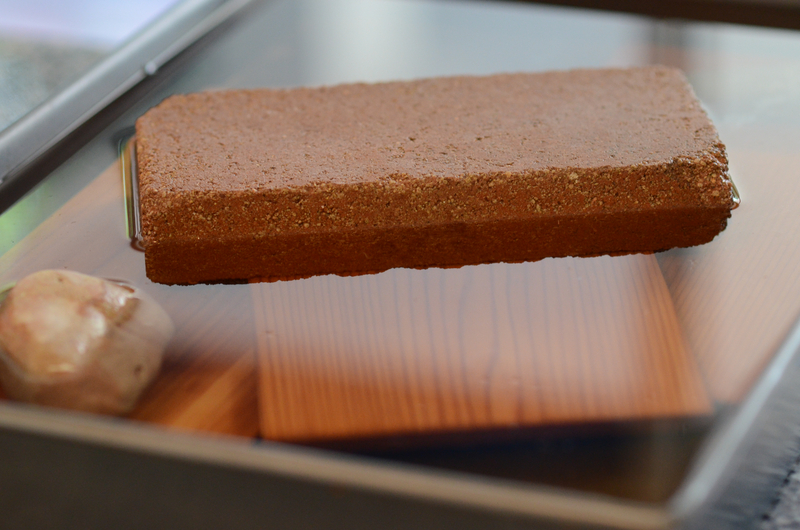 4-12 hours ahead, soak planks in warm water, and weigh them down with with heavy objects. This will keep them from burning during grilling. For added flavor, add wine or herbs to the soaking liquid. In a blender, combine the soy sauce, red wine vinegar, pickled ginger and brine, miso paste, sherry vinegar and chopped radish and puree until smooth. 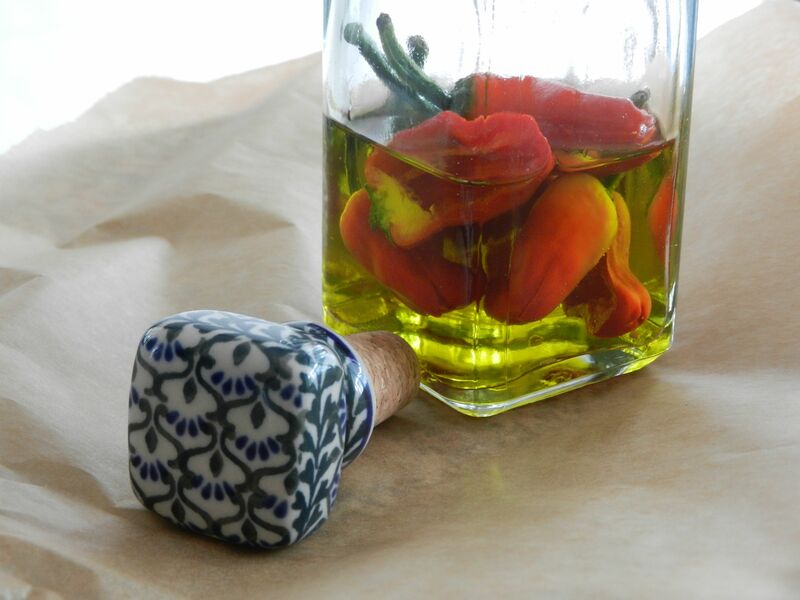 With the blender on, drizzle in the 1/4 cup of olive oil. 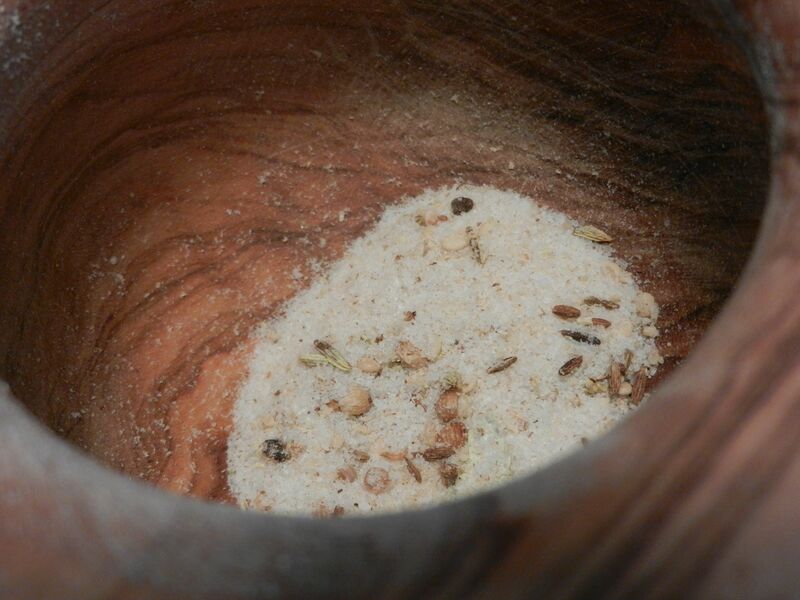 Season the vinaigrette with salt and pepper and transfer to a small bowl. Light a grill or start charcoal or wood. 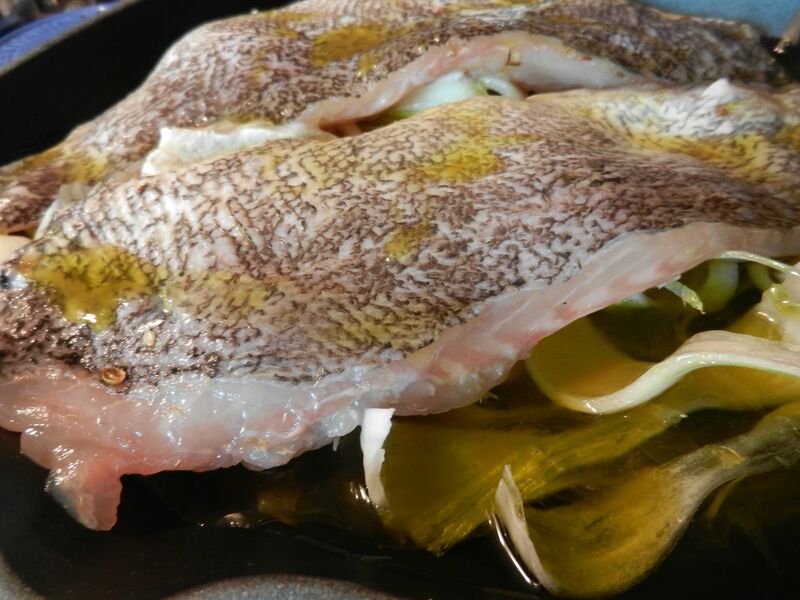 Season the snapper cavities with salt and pepper and fill with the poblano, thyme sprigs and lemon slices. Tie the fish with kitchen string at 2-inch intervals. 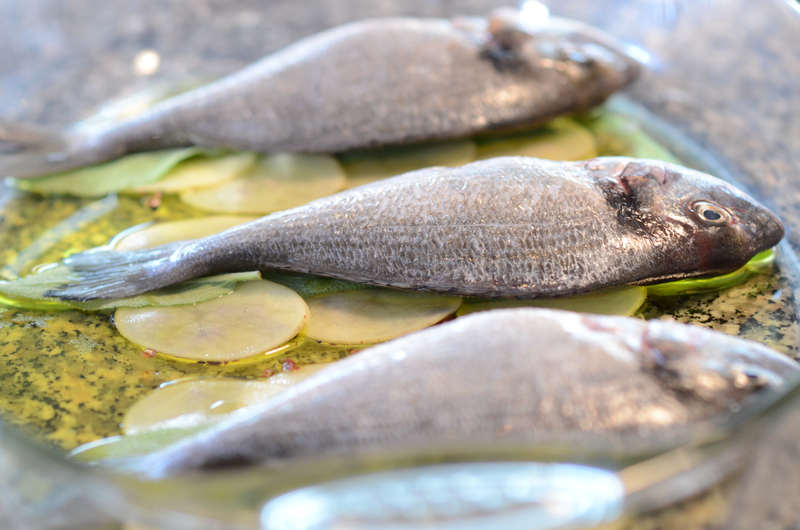 Generously brush the fish with olive oil and season lightly with salt and pepper. Alternatively, use filets, and layer the vinaigrette, chili, thyme, and lemon. If cooking filets, you will not need to flip the fish. 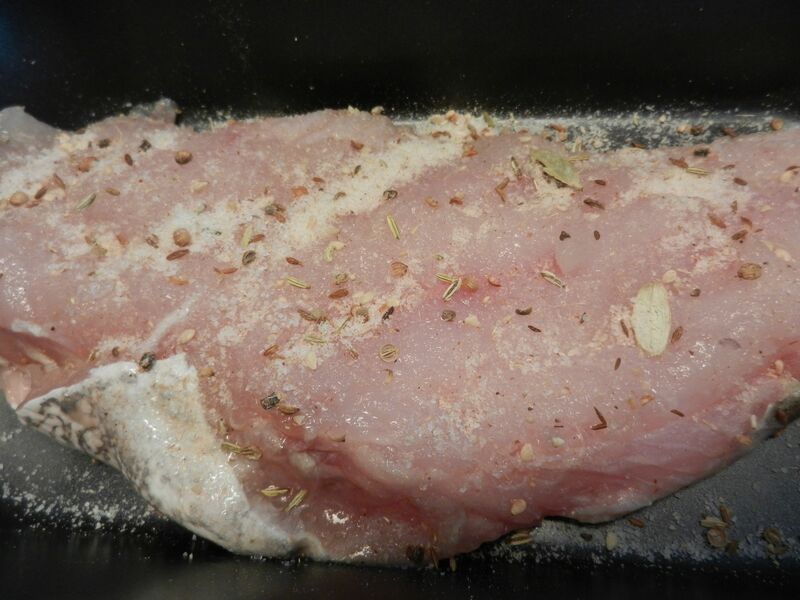 Set the fish on the plank and cook until the flesh just flakes with a fork, about 20 minutes. If flames flare up, spray them with water. Pull the fish before it is entirely done and let it rest on the planks for a few minutes before serving, where it will continue to cook. The planks will warp and char a little or a lot. That is OK, but keep an eye on what’s happening to the fish. In a medium bowl, toss the sliced radishes with the sprouts and 2 tablespoons of the vinaigrette. Top the fish fillets with the radishes. Drizzle a little of the remaining vinaigrette around the fish and serve. Improvise! 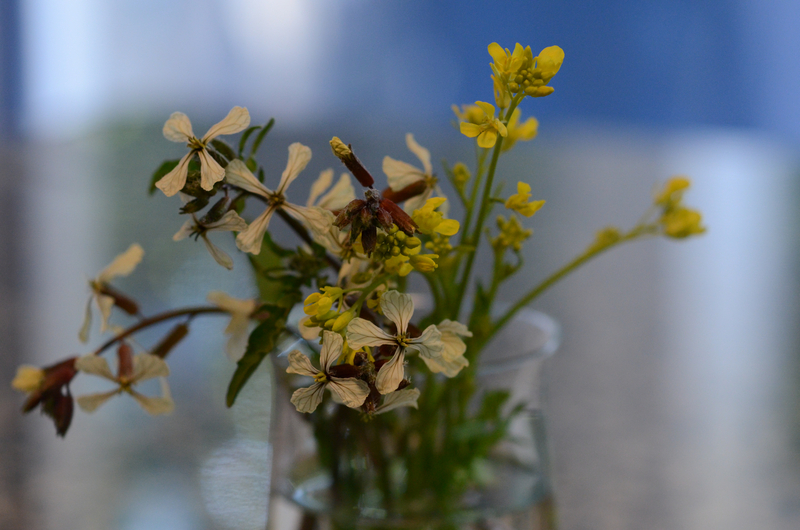 Radishes were not readily accessible to me, but I had mustard greens in the garden and mustard and arugula flowers to use instead of radish sprouts. I am on a “use it up” theme these days, but honestly, this way of cooking is what makes me the most satisfied, in general. I really get a thrill out of surveying what I have in the freezer, pantry, and refrigerator and then putting together something, hopefully, wonderful without making a run to the store or market. Today is Tunisian Labor Day so I’ve got a little time at home, mid-week. I am pulling long-horded foods out to the kitchen island so they are in my working notice. 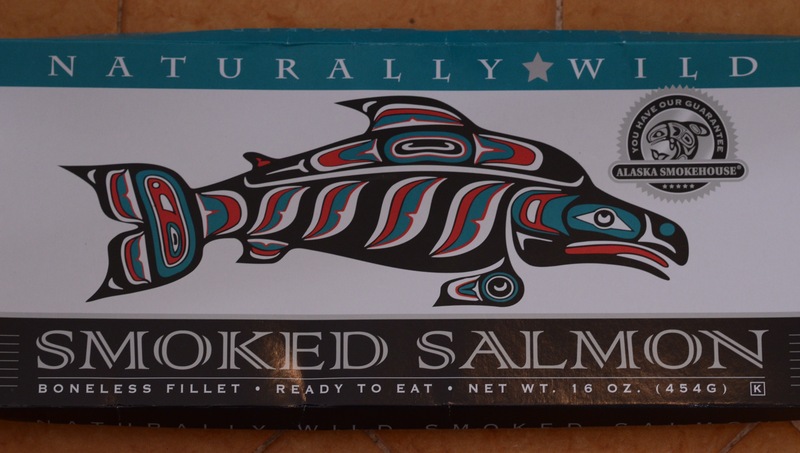 I’ve still got several artistic pastas from two trips to Italy in the past 5 months, and I’ve got this vaccuum-packed wild, smoked salmon filet that was backpack transported by my sons, at Christmas. Thinking of a preparation, I could mentally taste a light white sauce. I didn’t want something as heavy as true bechamel sauce and nothing overly cheesy. I think this combination could turn into tuna noodle casserole if I’m not careful. My go-to Italian cookbook, Made in Italy Food and Stories, by Georgio Locatelli has a white sauce for fish and pasta. 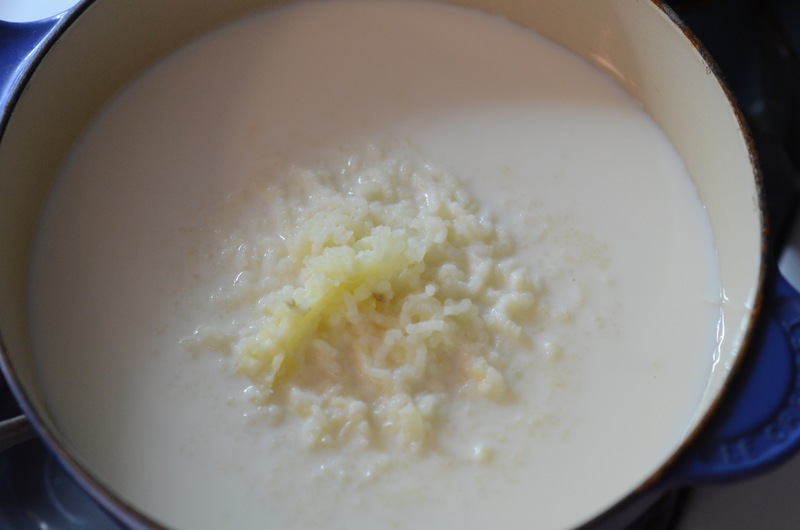 It is made with warm milk, not cream, and thickened with pureed potatoes instead of roux. At the end, you drop in cubes of a premade and chilled greens/butter. 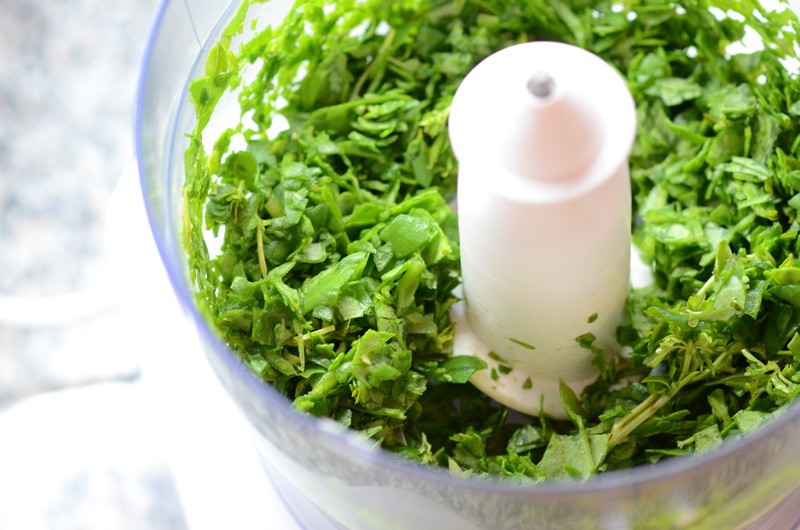 He is recommending basil, but you can vary the greens depending on the meat or main vegetable you choose to use. 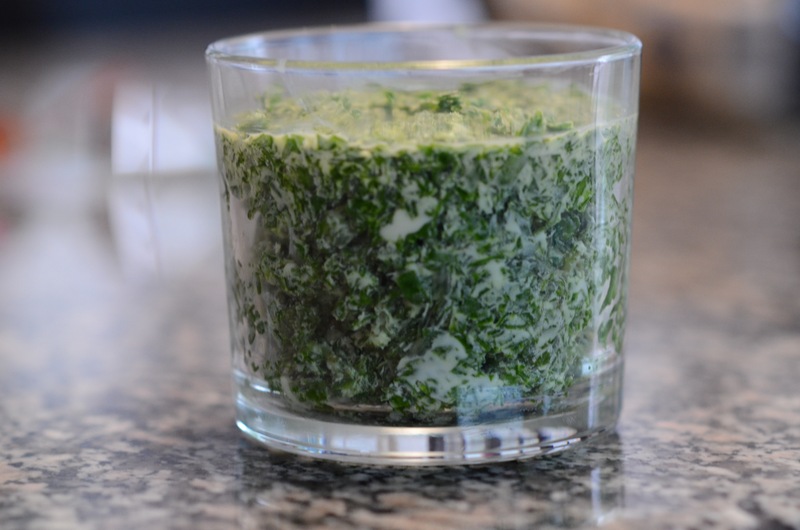 How about mustard butter with beef or swiss chard butter with chicken? This is the beauty of this dish: any pasta + any main meat or vegetable + any greens/butter will = a great, light(ish) pasta dish. 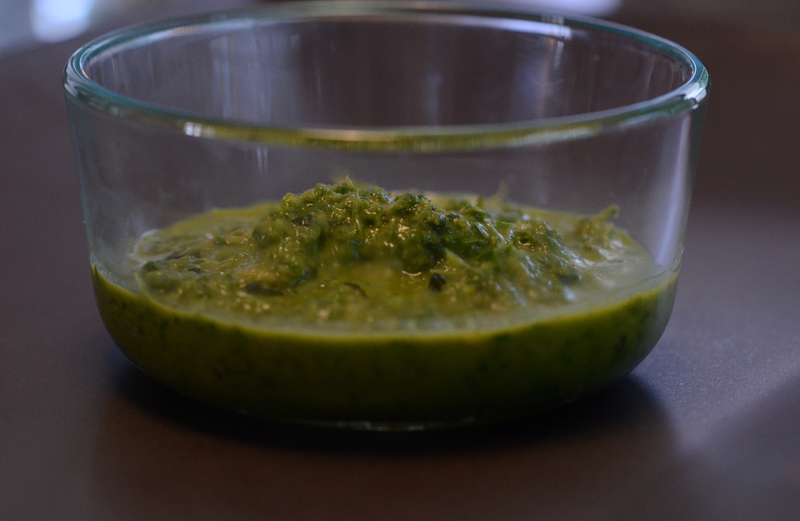 Put the greens in a food processor and chip them, then add the butter and process to a bright green paste. 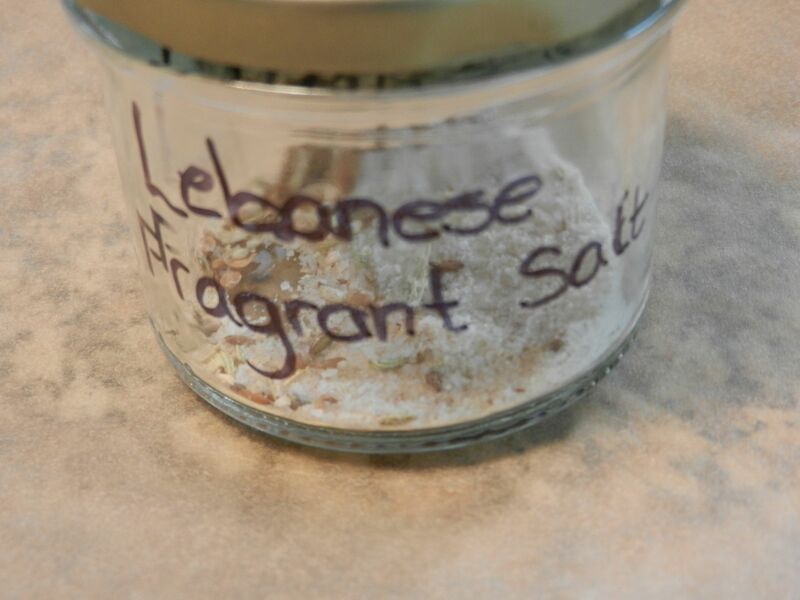 Spoon into a container and leave in the fridge until you need it. Put the whole peeled potatoes in a pan of cold salted water. Bring to the boil, then turn down the heat to a simmer and cook until soft. When the potatoes are nearly cooked, warm up the milk in a pan. Don’t let it boil; just heat it through, so that it won’t bring down the temperature of the potatoes when you add it to them. When potatoes are cool enough to handle, but while still hot, put through a fine sieve. Add the milk and season. Keep in a warm place. Meanwhile, cook the main meat or vegetable using your preferred method. You could pan fry, grill, bake or saute. 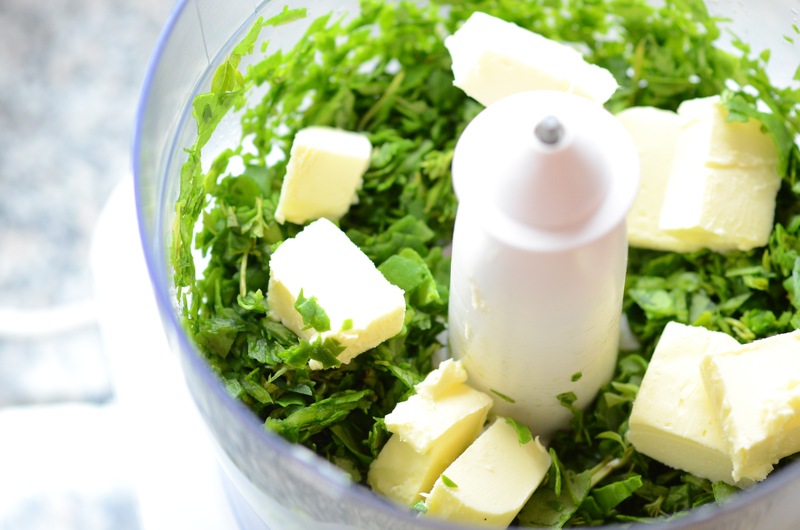 Put the potato puree back on the heat and whisk in the greens butter by spoonsful. 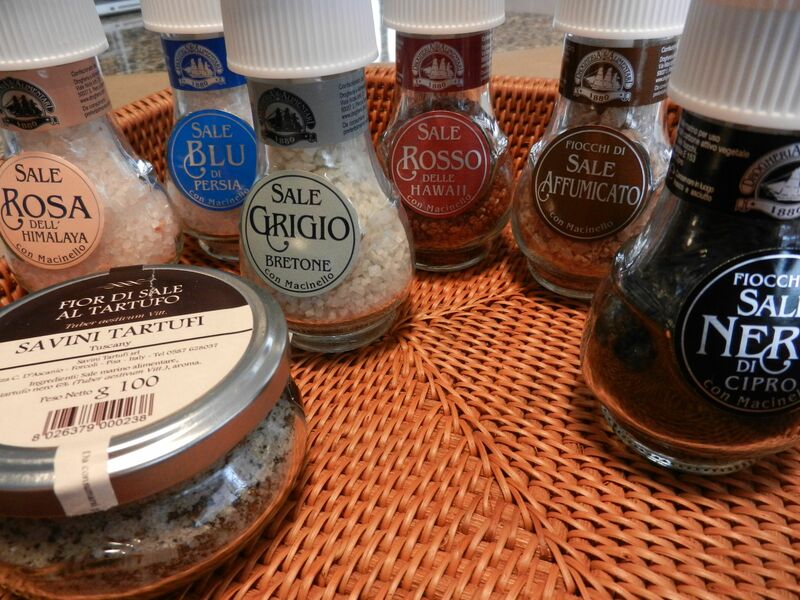 Finally, season with salt and pepper. 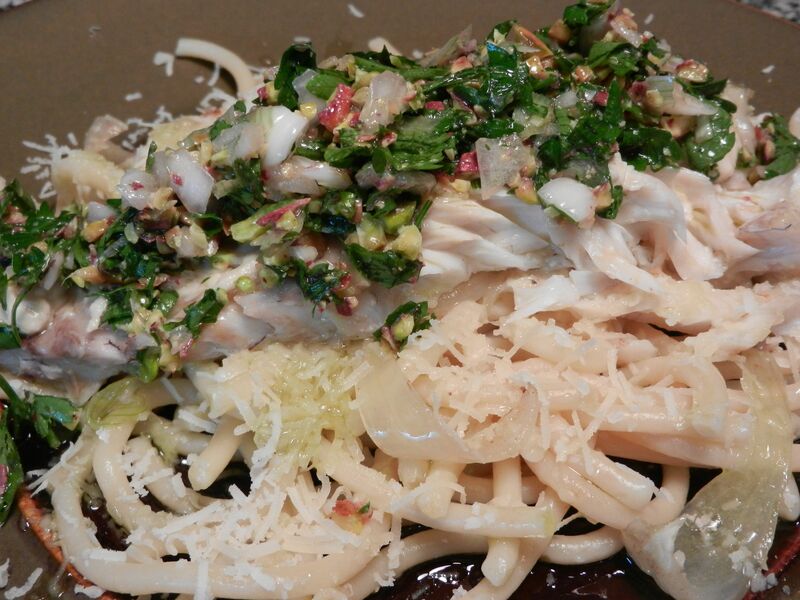 Toss the pasta into the sauce to coat. Serve the pasta, topped with the meat or main vegetable. Finely grate parmigiano reggiano to taste. For Northwesterners, the wood-smokey salmon, combined with the potato-cream sauce, was reminiscent of salmon chowder, but more refined. It was a nice touch of home for a rainy day off in Tunis. Most dinner restaurants don’t begin seating until 7:00, at the earliest, and more likely 8:00 or 8:30. This just doesn’t work so well for North American types, like us, who start their days at 5:00 AM. Because the restaurants open late, they generally take reservations for only one seating for the evening. Even if you swear you could get in and out before that 10:00 party who reserved the table arrives, the restaurant host is uncomfortable about releasing the table. Just when you find a restaurant you think could become part of your life, it inexplicably closes, moves, or changes in some other way that isn’t as good. I have learned, living here, not to set my heart or my stomach on going out to eat. If we think we are willing to make the effort to wait until 7:00 or 8:00 for dinner, we make a reservation, in French, another inhibitor, to be sure that the restaurant still exists and we have the required booking, but I always have a meal backup in mind just in case some part of the plan falls through. We had a restaurant that was becoming the go-to of the school community named Le Golfe. Foolishly, I always puzzled why it sounded like a golf club restaurant and only just recently realized it is French for “the gulf” as the restaurant sits right on the beach, looking out at the Gulf of Tunis. We really liked this restaurant because it had a hip, modern interior, beautiful interaction with the sea and breezes, and a good menu. Most of all, we came to realize that by 6:00 PM, some Tunisians would still be sitting around at tables finishing a long leisurely lunch and if we bullied the host just a little, and absolutely swore we could vacate the table within 4 hours, we could also get in. This was working so well for us that one Friday evening, when I really wanted to eat out, I broke my own rule about having a backup. In the morning, we had agreed we would have dinner there and I enjoyed thinking about that prospect all day long. When we pulled up to the restaurant, however, we were confronted with mounds of dirt surrounding the building and a backhoe, smashing down the roof and walls with its bucket. I was devastated, partly because I really liked the building the way it was, but mostly because I then had to go home on a Friday evening and spend a couple of hours in the kitchen, after all, making a dinner. I was also disappointed because I almost always have the same thing there and I was hungry for it that day. The title of my favorite dish on the menu includes poisson, vapeur, and pommes de terre. I can’t imagine why I ever ordered it in the first place, but it turned out to be a small, white fish called dourade, steam cooked in a crust of thinly sliced, crunchy potatoes. The combination of the moist fish and crunchy, salty potatoes is haunting and I get really hungry sometimes for that exact dish. I drove by Le Golfe last night. I didn’t really expect they would be ready for business, but I wanted some indication whether or not the restaurant might ever be in my life again. Some sort of renovating is going on, but I can’t be sure it is going to be reopened as a restaurant. It might be someone’s home, which also hurts my feelings because if I could have picked any different place to live in Tunis, other than my own sweet house, it would have been in that restaurant. 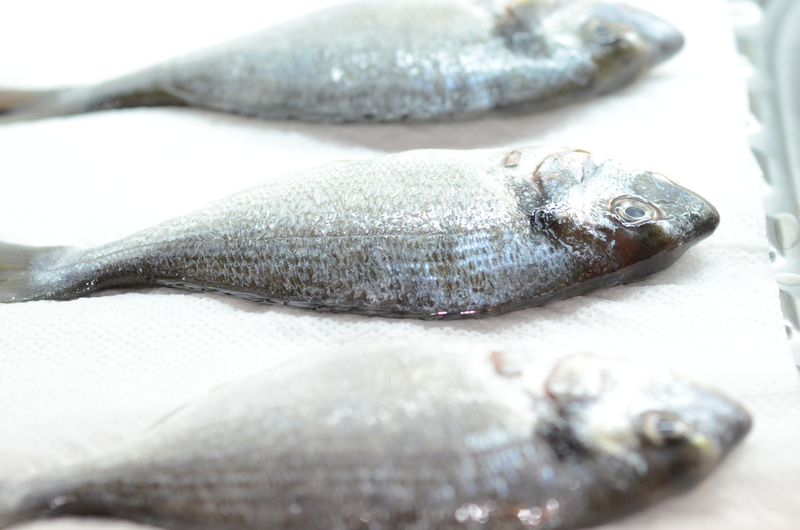 Anyway, I knew I had to take matters into my own hands if I was to satisfy my fish craving anytime soon, so I went right to the fish market and brought home a few little dourades for dinner. 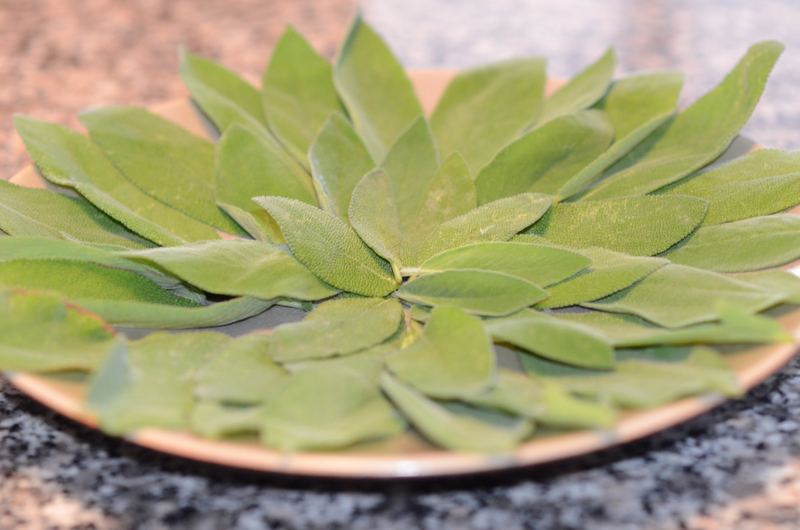 The sage in my garden has had a recent flush of spring growth so I snipped plenty of sage leaves to layer in, too. I do recall that the potato crust at the restaurant isn’t firmly adhered to the fish, but just layers around it, so I first built little potato and sage rafts in a baking dish on top of some olive oil, sea salt, and Szechuan pepper. I laid the fish on top and oven fried that first side. Then, I removed the fish and potato, letting it drain for a minute while I built the second side in the dish. Flipping the fish, I cooked side two, crisping the potatoes and sage. I still have to work on my potato fish scale technique, but I am happy to tell you that I achieved the flavor and most importantly, the texture of the dish and I can satisfy my craving now, with or without the restaurant. Thank you for pretending with me that these overexposed photos are arty. I am still struggling with adjusting for shutter speed and aperture at the same time.